Kids always like to have fun and now you can make eating healthy even more fun for them with this cute healthy eaters lunch box prize pack! Love the ladybug and watermelon patterns so cute! Your little eater will flip for this fun package! 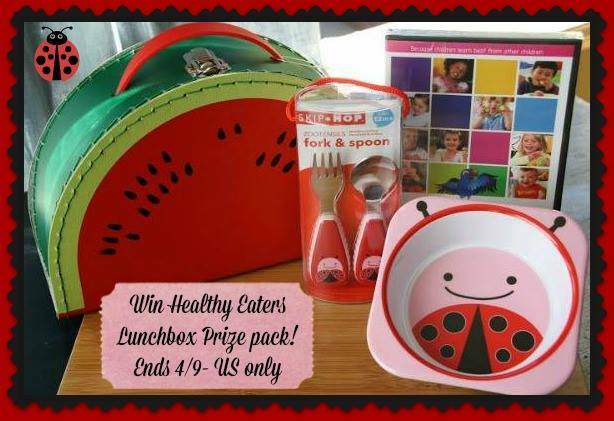 Includes watermelon lunch box, ladybug plate and utensils, and a Copy-Kids DVD! One lucky reader will win a Healthy Eaters Lunchbox Prize Pack! Giveaway ends 4/9/14 at 11:59 pm ET! Open to US residents 18+ and older. there favorite food would be raising canes. Mac & cheese and pizza and grilled cheese of course. They eat anything though. Not picky at all. my daughter likes to eat chicken nuggets sometimes and eats bananas and pears. Grilled cheese & chips is the fav. A Ham & Cheese sandwich with Chocolate Pudding, Yogurt, Peaches, a Cheese Stick and a fruit roll up. Pizza 24/7 could be eaten anywhere and anytime. My kids really like peanut butter and jelly for lunch. My kids love chicken nuggets and french fries. They like pBJ best and cheese too. My kids love peanut butter sandwiches for lunch. Granddaughters favorite lunch is mac and cheese. They love Grilled cheese sandwiches. PB&J is a close second. Hot dogs & spaghettios at the moment. Mac and cheese! Thanks for the giveaway! Pita and hummus, tomatos, and chicken! Pb&j is a favorite here. Peanut butter and jelly sandwich! My gals love peanut butter sandwiches. My kids favorite lunch is a banana rolled into a tortilla with a layer of peanut butter and a side of strawberries! The lunches that are usually the biggest hits are ones with p.b. & apple sandwiches, plus yogurt and sugar snap peas. That would be pizza or diced fruit and cheese. Abagail and Austin love Mac N Cheese – I cook it with carrots and they eat It constantly! My kids actually beg for leftovers! My sons favorite lunch is pizza.